On the postcard sized album cover I see a horse standing in a forest, his head covered with a piece of cloth. This position reminds me of the pictures of detainees on Gunatanamo bay detention camp, and this hopeless situation, where ears and eyes are excluded from the rest of the world, raises a question about time. How is it being perceived when there is no external means to experience the flow of seconds, minutes or hours? Is there, in fact, time? Coming from the ‘Against it’ records, this three way split is the first musical attempt of the label to explore and understand time. The three projects featured on this album give different interpretations and meanings to this subject with tracks that vary from experimental moments with numerous sounds colliding together into one primordial soup, to endless drones and obscure voices. Opening the album with six tracks is the InfraRed Experience. In these six tracks the musical instruments employed are only electric guitars and effects, which bring to life lush and endless sonic landscapes that are rich with details as well as with empty deserts. One of the more tangible moments from this part is the track “Goodbye is not Farewell”, which strangely reminds me of a part on Iron Maiden’s Rime of the ancient mariner. This is a strange moment but, if I am to stick with my questions about time, a suitable one. Bleeding Thorax offers three nerve breaking tracks of stressing drones. ‘Feral’ is an animalistic, repetitive and hostile hissing that gets us close to a dying beast, wildly breathing its last gasps of air. The seventh track, donning the graphic title ‘Rip Her On The 4th Floor’, along with the following track, ‘The black widow & the babe in barbed wire’, are both haunting and alarming drones of clear serenity and grim sonic visions , in which time seems to both stand still and be affected by the slow, yet rich dynamics of this musical act. Flat Black Project ends this album with eerie music which accompanies the immortal, decadent speech from the movie ‘The Exorcist 2’, thus getting us to the final phase of the album, where music grows darker. The last five tracks are all obscure and deal with ghostly feedbacks and echoes that make Flat Black Project quite unsettling. The first track by this project, ‘Humanity at its best’ is perhaps the best on this part of the album, bringing together hate, cruelty and paranoia. 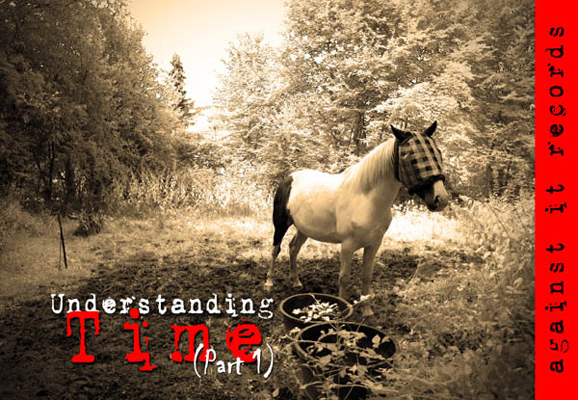 Whatever the future brings for this time learning musical project, part one of ‘Understanding Time’ is a powerful release with three worthy musical projects to introduce. Let us hope to see part two coming out soon!